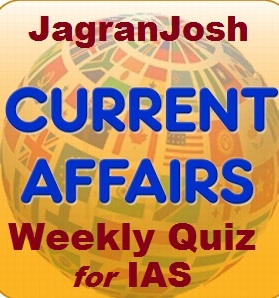 Get the list of current affairs IAS questions created from the events happened in the recent weekdays only. Such questions are quite important for the preparation of IAS Prelims Exam 2017. The IAS Prelims Exam 2017 is to be held on 18th June 2017. The IAS aspirants have to be very selective while doing study during the last leg of IAS preparation. The importance of current affairs in IAS Exam is already known to every IAS aspirant. It has been found that in the last few years IAS Prelims Exam, the frequency of asking current affairs questions have been increased. Current affairs have become one of the core subjects to study for IAS Prelims Exam as well as for IAS Mains Exam. Here, we have provided a set of articles consist of current affairs quizzes created from the events happened in the last few days. We have covered the events of national and international importance in quiz form and the questions are completely based on the pattern of UPSC IAS Exam. Practicing such IAS questions will help IAS aspirants to gain a momentum in their preparation of IAS Exam. In this article we have covered the topics like- CARTOSAT-2, Food Legumes Research Platform (FLRP), Pandit Deendayal Upadhyay Unnat Krishi Shiksha Scheme, India’s first first-ever floating elementary school and The International Intellectual Property Index 2017. In this article we have covered the topics like- the PSLV-C37 Satellite Mission, Indradhanush 2.0, New IMF Training and Technical Assistance Centre (SARTTAC), festival,”Kambala” and India’s first floating elementary school. In this article we have covered the topics like- the Nilambur teak, Geographical Indication (GI) tag, second edition of Hunar Haat, Prithvi Defence Vehicle (PDV), INS Sarvekshak and the Extradition Act, 1962. In this article we have covered the topics like- the indicators of Digital Profile of India, killer rip tides, AMAN 2017, no Suo Motu power and Pradhan Mantri Gramin Digital Saksharta Abhiyan.